Wow, what an active day! I am spent. You’ll see why, but maybe this much activity is normal for most of you. At 1 a.m., Karma the cat woke us up with his meows and from that point on, I tossed and turned. When I did fall asleep, I was dreaming that I slept through my alarm or that I went to the YMCA for Body Pump and the gym was closed again. At 5 a.m., my alarm went off and I realized I hadn’t experienced what I had been dreaming about. It was really time to get up and get dressed for the gym! I quickly got dressed and grabbed some cereal plus half of a banana for some fuel. I met my friend Laurie at the 5:30 a.m. Body Pump class. I was tired, but once class started, I woke up. It felt good to get a workout in by 6:30! 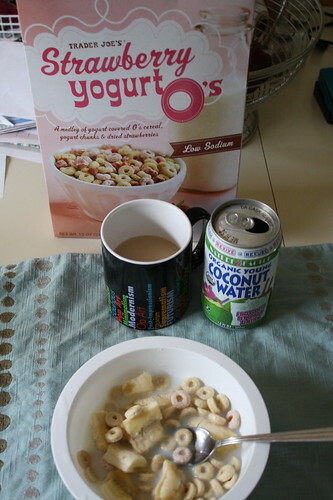 I fueled up some more with cereal and the other half of the banana plus a bit of coffee and coconut water. The TJ’s cereal was just ok–not mine or Craig’s favorite. It was my first time trying coconut water and I liked it. I figured I needed something like that after Body Pump to get some electrolytes into my system. I am glad I got my clothes ready for the day & my yoga gear packed last night, because then I had to meditate for 25 minutes after I showered, dried my hair and put on makeup. 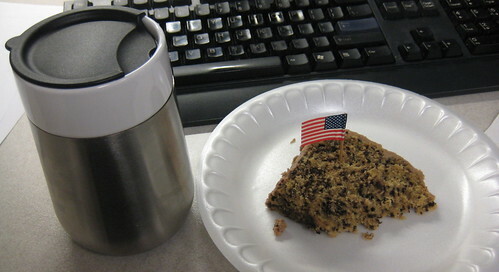 I didn’t get to work until 8:30 and right away, I hit up the free coffee upstairs and found an unexpected piece of cake made by a volunteer at work. She was so cute–she said “since you’re one of the first ones here, I’ll give you this too.” She put the flag in my cake for flag day! 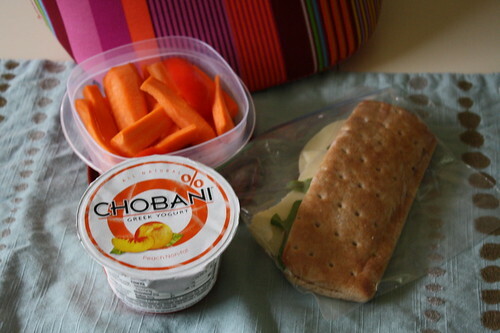 Lunch was a turkey and provolone sandwich, a peach chobani, and lots of red pepper and carrot slices. After lunch, it was time for my second exercise session of the day–yoga! However, we had a substitute teacher and she combined tai chi, yoga and pilates. Oh man this killed me. The pilates work got me sweating! I am sure the stretching helped my post body pump aches and pains. 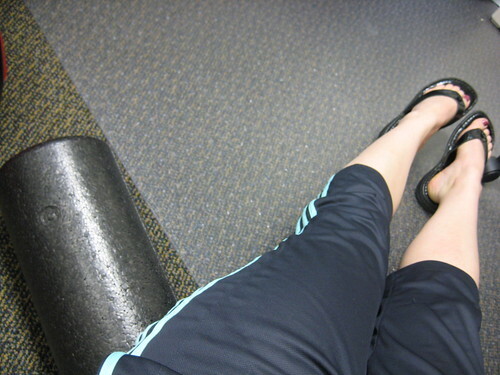 I also foam rolled at work just to be safe. And after work, I cut the grass for about 45 minutes. Luckily, this was my last activity of the day and now I am plopped on the couch and relaxing! 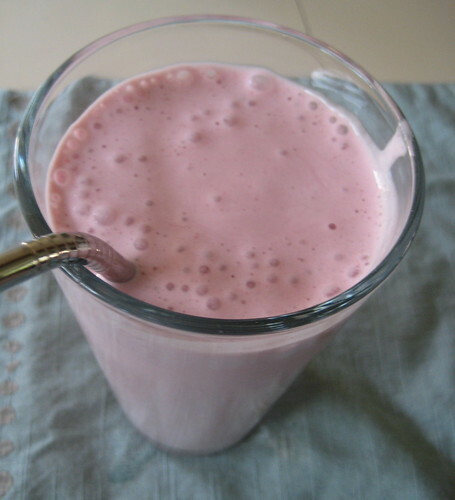 Dinner was a strawberry smoothie with soy protein powder, Chobani strawberry yogurt, frozen strawberries, and skim milk. 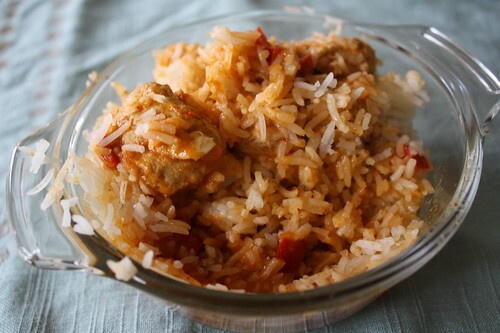 That wasn’t enough for my very hungry tummy, so I cooked up something quick and made the gardein thai trio I got the other day. I liked it and would buy it again. I only ate half, so I’ll have the other half to look forward to for lunch tomorrow. We’re watching Master Chef and I kind of have a crush on Max. 🙂 I hope he stays on the show for some eye candy! After such an active day, I am definitely declaring tomorrow a rest day! Looking forward to reading and lounging on the couch.